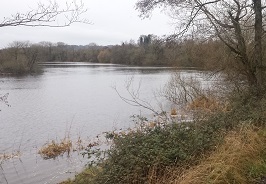 Keeping rivers free from blockages is particularly important this time of year. The rain from Winter storms increases flows in our rivers while there is more wind blow debris in the rivers and channels. Blockages usually occur at restrictions of the river flow, at bridges, culverts and other obstacles. Culverts are a particular risk. A culvert is a man-made tunnel that allows a stream or river to flow underground or under an obstacle. 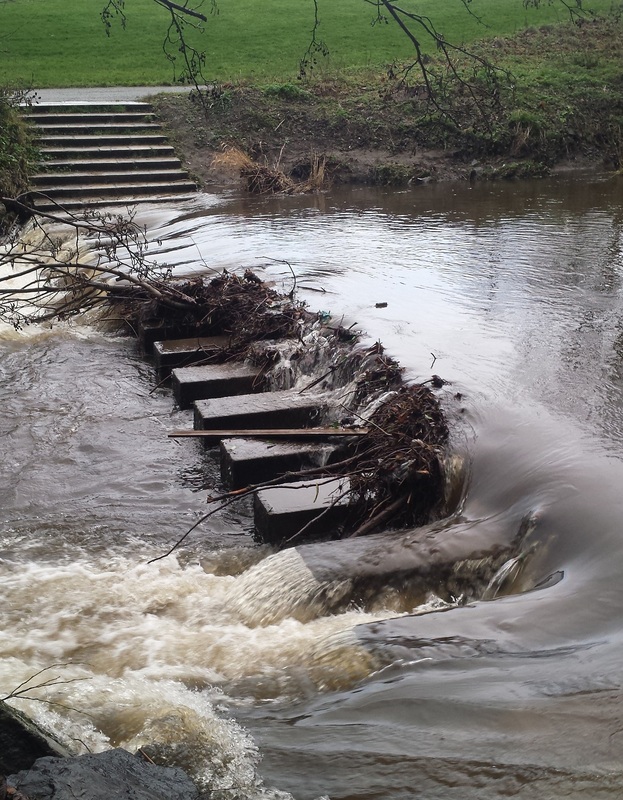 If a culvert becomes blocked it is difficult to clear and can cause serious flooding upstream. 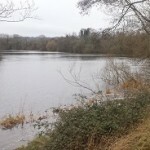 A blocked culvert was the cause of serious flooding in 2009 in my home town of Sallins, but culvert blockages cause flooding throughout Ireland every year. 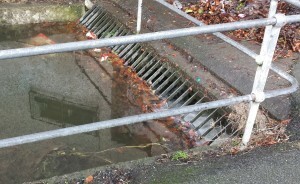 To prevent a culvert blocking, metal screen are usually placed at the culvert inlets to prevent debris entering the culvert. However the screen itself is likely to cause a blockage. See a culvert screen I noticed in the town of Naas during the Christmas break. The gaps between the screen members were small enough that fallen leaves were getting trapped and beginning to create an obstruction. Thankfully it was being cleared out regularly, at least by the evidence of the pile of adjacent debris. As can be seen the type and size of a culvert screen requires some thought. It should be designed to limit blockages. But as blockages will probably still occur (see above) it should be designed to be easy to clear out and allow safe access for this cleaning operation. A maintenance strategy needs to be implemented to ensure that the culvert is monitored for blockages while they are developing, rather then waiting for a flood to occur before the culvert screen is cleared. Think of fish when building culverts. The screen should be designed in such a way so that it allows fish and other aquatic life to pass through. Another problem for river life is that the culvert outlet is installed a little above the original riverbed. This doesn’t affect drainage, it actually probably improves it, but it creates a slight waterfall at the outlet. Overtime this water fall deepens the riverbed locally creating a larger and larger ‘hanging step’, which eventually the marine life will be unable to navigate. Also culverts can be purposefully oversized by engineers to prevent blockages during floods. However if this is achieved by making a very wide culvert, it can leave water levels too low in the stream, during dry conditions, for fish. We are actually relatively lucky in this Country as in North America a common problem is that beavers try to block small culverts to create a pond behind! The debris were only blocking the central portion of the river, but it was enough to raise the river level behind and prevent use of the concrete stepping stones to cross the river. Environmental importance of partial rivers blockages. The above are examples of blockages starting to develop at man-made obstructions in the river. But along the rural course of rivers many trees fall into the river and are left there undisturbed. While canoeing on the River Liffey, I am surprised at the number of overturned trees that are partially blocking it. These fallen trees are an incredibly important habitat for fish. They provide a place to hide, rest from strong currents and the insect life on the tree are a food source. Thankfully water can usually get by these fallen trees easier than a man in a canoe. So while maintenance and clearing blockages is really important to prevent floods. But we shouldn’t create lifeless man made drainage channels, by only considering flow-rates and not the marine life in our rivers.